Iresine flavescens H. & B. ex Willd. Habit: Iresine flavescens grows as a semi woody clumping perennial to 1.5 m in height (usually shorter). 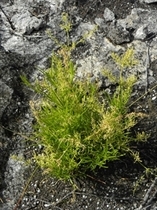 The leaves are arranged oppositely, linear-lanceolate, petiolar or subsessile with an entire margin and acute leaf apex. The incomplete, imperfect, zygomorphic flowers are arranged in terminal panicles. The flowers are subtended by 3-4 bracts and numerous hairs. The calyx has 5 unfused sepals. The corolla has 5 unfused white petals. The staminate flowers have 5 unfused stamens and a nonfunctional carpel. The carpellate flowers have 2 nonfunctional staminodes, a superior ovary with a single locule and seed. The fruit is an achene at maturity. Habitat: Iresine flavescens grows in saline areas along the coast or edges of mangrove flats, rocky outcroppings, dunes, and Pine Woodlands as well as Dry Broadleaf Evergreen Formation – Shrublands (coppice). Distribution in Bahamas/Globally: Iresine flavescens occurs on all island groupings within the Bahamian Archipelago as well as the southern United States, the entire Caribbean region. 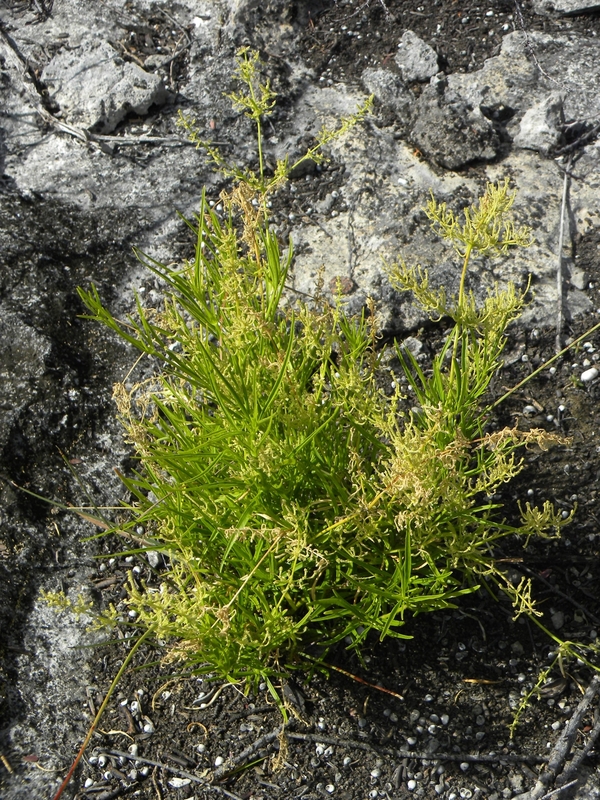 Medicinal/Cultural/Economic usage: Iresine flavescens is not used medicinally in the Bahamian Archipelago.